506 Carlton streetcar service will be restored with bus supplement. From September 2nd to October 6, 2018, there will be a temporary bus diversion due to streetcar tracks replacement at Dundas and Lansdowne. Details are provided below. The City’s Heritage Staff has asked my office to share the following update on the Terracotta House at 20 Jerome Street. 20 Jerome Street is listed on the City’s Heritage Register for the building’s cultural heritage value and unique decorative tiles. In April 2018 a wind storm caused tiles to start falling off of the west elevation of the building. The subsequent partial collapse of the wall revealed serious irregularities in the building’s original construction. Following this incident, the owner provided a report from a structural engineer which detailed irreversible flaws in the existing structure. In response, Toronto Building issued an Order to Remedy an Unsafe Building as a matter of public safety. City staff concur with the structural engineer’s conclusion that demolition of the building is necessary to make the site safe and staff is confident that there is no reasonable alternative. Therefore, staff have accepted the demolition of the building but have worked with the owners to ensure the house is appropriately documented and commemorated. The owners have provided a salvage strategy for the decorative tiles, archival photographs of the building and tiles, a detailed history of the property and a comprehensive commemoration plan. The owners have met all requirements of the Order to Remedy an Unsafe Building as well as the requirements to demolish a listed building under the Ontario Heritage Act and the Municipal Code. The commemoration plan will celebrate the history of the property through the display of salvaged tiles on the site. A selection of tiles will be displayed on the new house in one location on the front elevation and six locations on the west side elevation. A garden wall will be erected in front of the house parallel with the street. Lastly, a Heritage Toronto plaque will be displayed on the property to communicate its unique history. In addition to on‐site commemoration, some tiles may be displayed off‐site depending how many tiles can be salvaged and if HPS staff identify worthy opportunities. Community members and organizations are encouraged to suggest any projects that could incorporate some of the remaining tiles. Questions or suggestions can be shared with my office at councillor_perks@toronto.ca and/or Kristen Flood, Heritage Preservation Services, kristen.flood@toronto.ca. The Parkdale Good Food Market brings together low-cost, local produce, community art, and music to build community in Masaryk Park every Thursday afternoon throughout the summer. Bring your little ones! We’ve got art making with Making Room Community Arts and a drumming circle at 5:30 pm on July 9. Local vendors bring us some of the best momos and samosas in the city. Join together with your community at the Dunn Parkette Learning Garden to create phase one of the Dunn Food Forest! We will sheet mulch a garden bed that will break down to create amazing soil for the future Dunn Food Forest. Sheet mulching is a process in which nitrogen (manure, compost) and carbon (cardboard, straw, mulch) rich material are layered. These layers break down over time to create healthy soil that is full of life. A food forest mimics the elements of a thriving forest ecosystem bringing together a community of edible plants from ground cover to trees. Bring food to share for a community potluck. 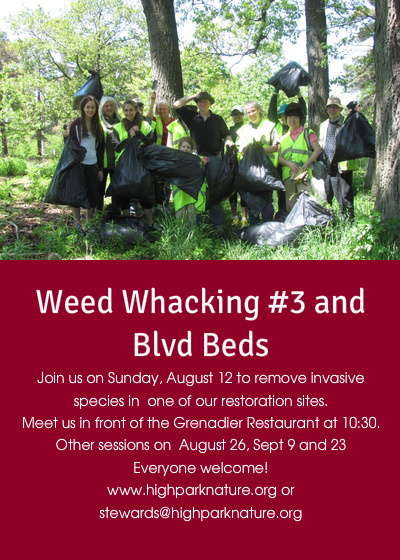 Join the High Park Stewards on August 12 to remove invasive species in one of their restoration sites. Meet up in front of Grenadier Restaurant at 10:30 am. For more information, visit https://highparkstewards.pingg.com/WeedWhacking3-2018 .